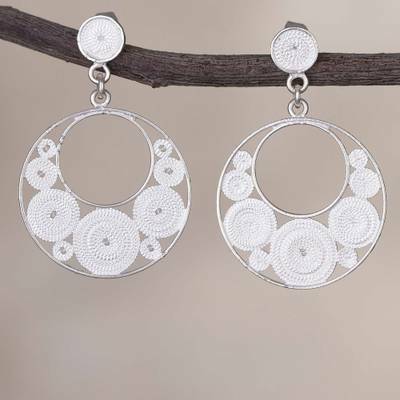 Crescent-Shaped Sterling Silver Filigree Earrings from Peru, "White Dreamy Crescents"
Filled with lavish circles that are handcrafted of gleaming sterling silver filigree with a frosty appearance, two open crescent shapes dangle from the ears with a dreamy beauty. Peruvian artisan Giuliana Valz-Gen designs this lavish pair of dangle earrings, sharing her passion for jewelry with the world. You can find sterling silver filigree dangle earrings 'White Dreamy Crescents' by Giuliana Valz-Gen in jewelry categories such as No Stone Earrings, Silver Earrings, Sterling Silver Earrings, Dangle Earrings and Filigree Earrings. Enjoy exploring these sections for other Novica treasures.